The Learn OneNote Conference officially starts today. I'm so excited to be a part of this 3rd Annual event! If you haven't signed up for your free ticket, you can do so at https://learnonconference.com/?affiliate=denisev and be able to catch all the sessions as they go live and watch them as many times as you want through Monday, November 19 at 11 am CST. If you want a lifetime All-Access Pass to the 35+ sessions, you can get individual or group passes. More info when you register. Follow along on your favorite Social Media sites (especially Twitter) with the #LONC18. Share, tweet, post your "Ah-hah" moments with us by using the hashtag. Follow all of the speakers with Jared DeCamp's list on Twitter. 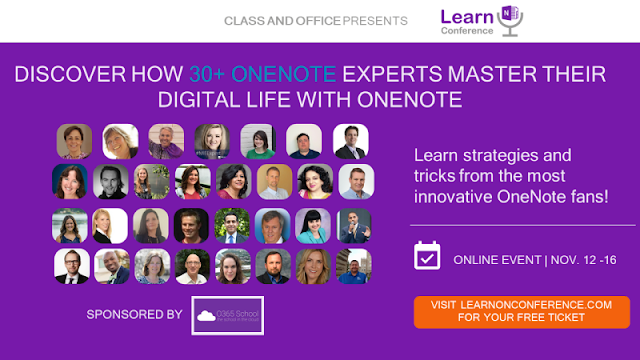 As if you had any doubts, I'll be keeping track of the sessions, speakers and my notes in OneNote.